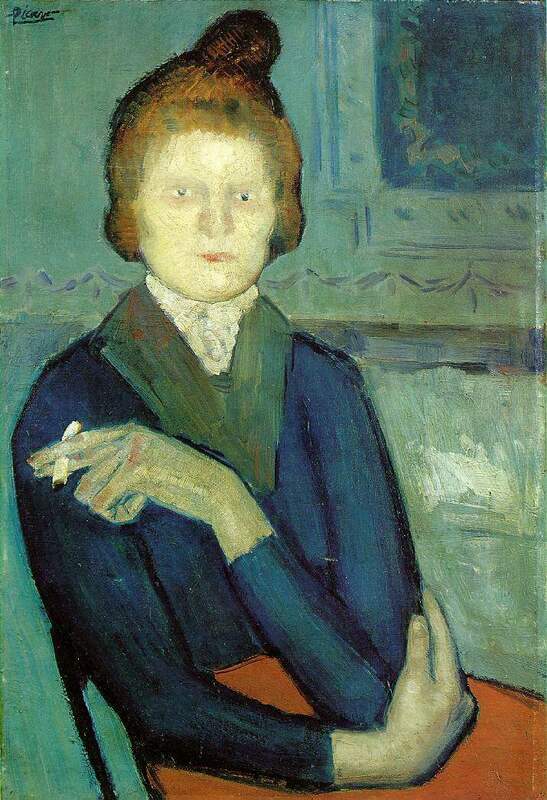 Picasso's numerous scenes of women in cafes, often represented alone, drinking or smoking, record his experiences of life in Montmartre in the early twentieth century. At the same time, they develop a subject much explored by many painters associated with the Impressionists. Amongst these, Edgar Degas (1834-1917) was best known for his numerous portrayals of women in cafes, thus capturing a changing aspect of social behaviour brought about largely by the transformation of Paris in the mid-nineteenth century under Napoleon III, However, Picasso's Woman with at Cigarette also draws on other sources stylistically, In particular, the elongated form of the body, with its excessively long, limbs and hands, recalls the work of El Greco. The spirituality and mysticism that inspired El Greco resulted in then representation of ethereal bodies, almost devoid of physical substance. Such a means of representation provided Picasso with the perfect vocabulary with which to represent his social outcasts, their languid postures and emaciated physiques symbolic of the harshness of modern urban poverty.